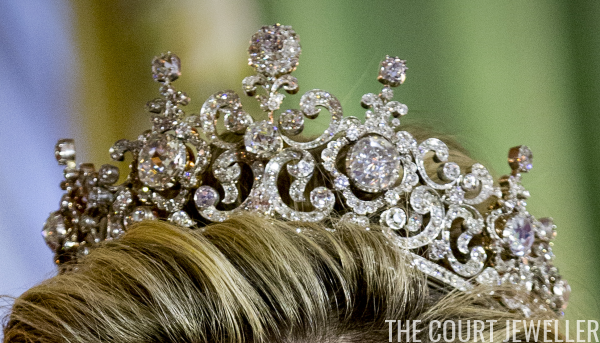 State Visit Jewels: The Stuart Tiara Reappears! 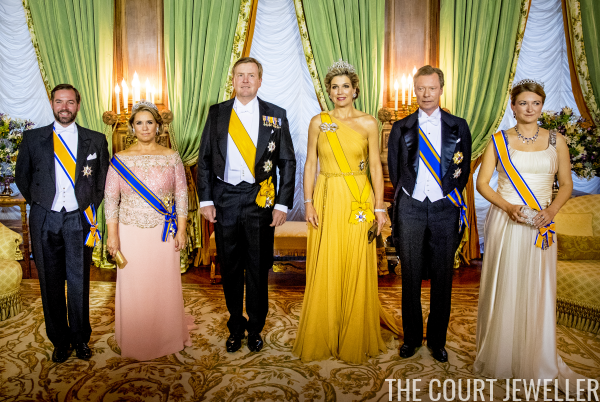 King Willem-Alexander and Queen Maxima of the Netherlands are in Luxembourg for a state visit this week, and Maxima took the opportunity to debut a highly-anticipated jewel: the magnificent Stuart Tiara! The tiara itself was slightly less magnificent than it's been in past appearances. It's been reworked significantly since we last saw the piece -- which was during Queen Juliana's reign. 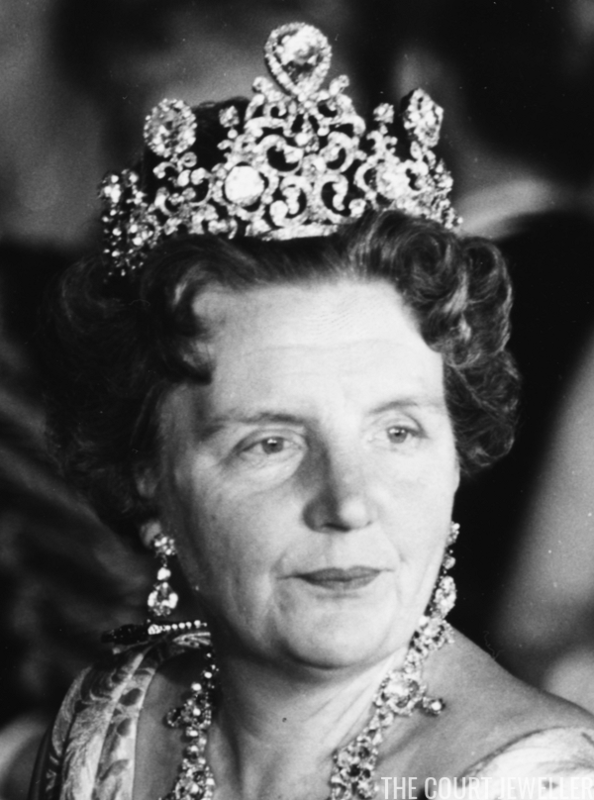 Here's a look at her version of the tiara, worn here for her birthday celebrations in 1962. 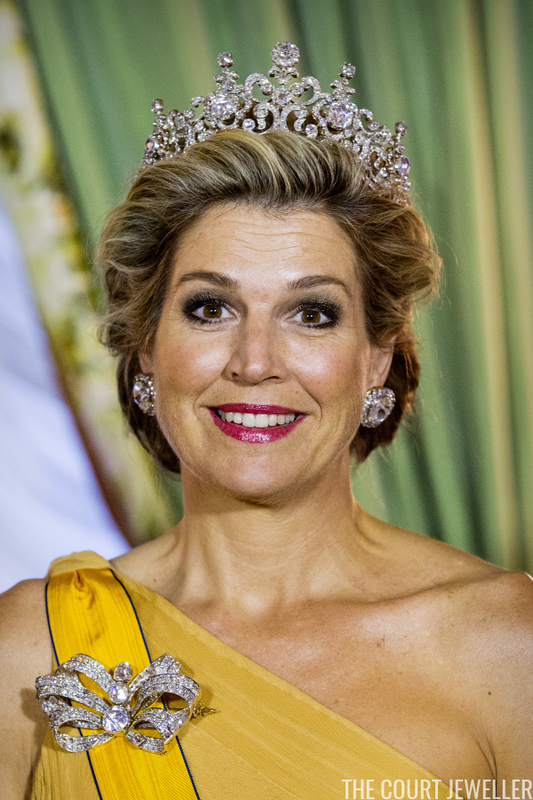 The tiara has been in the family since 1897; it was worn in 1898 for the first time by Queen Wilhelmina at her investiture. The Stuart Diamond itself has a much longer royal history. But you'll notice that there's something very important missing from the tiara on this occasion. Maxima wore a lower-profile version of the sparkler -- most notably, the Stuart Diamond itself was not worn at all! It has been removed from the piece on this occasion, along with part of the central element that supported it. (Queen Wilhelmina also wore a smaller, Stuart-less version of the tiara for her wedding in 1901 -- this may be that setting.) The result, to my mind, is a much more wearable and balanced tiara, still incredibly sparkly and elaborate but less imposing. The large round diamonds that used to sit atop the tiara on either side of the Stuart have also been removed. They've been repurposed as an enormous pair of diamond cluster earrings, which Maxima also wore tonight. Here's a closer view of the new version of the tiara. It does feel a little strange to call this "the Stuart Tiara" when the diamond is missing. (The Stuart-less Stuart?) 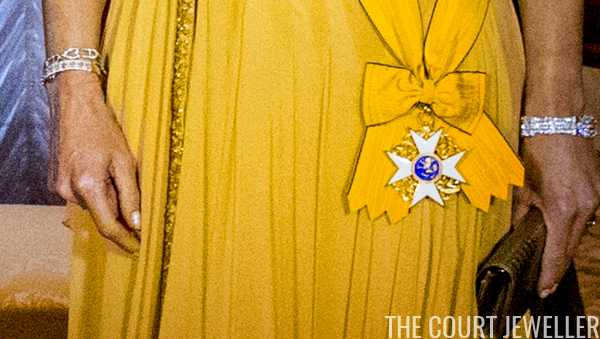 I hope we see Maxima wear the diamond itself again soon -- perhaps as a pendant on a necklace or a brooch. 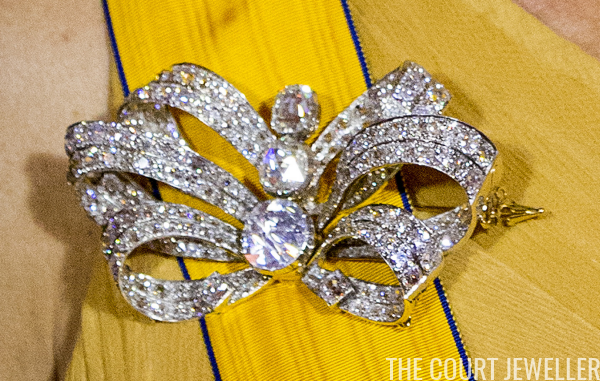 Speaking of brooches, Maxima did also wear part of the large bow brooch from the Stuart Parure tonight. She wisely left off the necklace, which she debuted last year. But she did wear diamonds on each wrist, including the diamond bracelet with her family's initials. 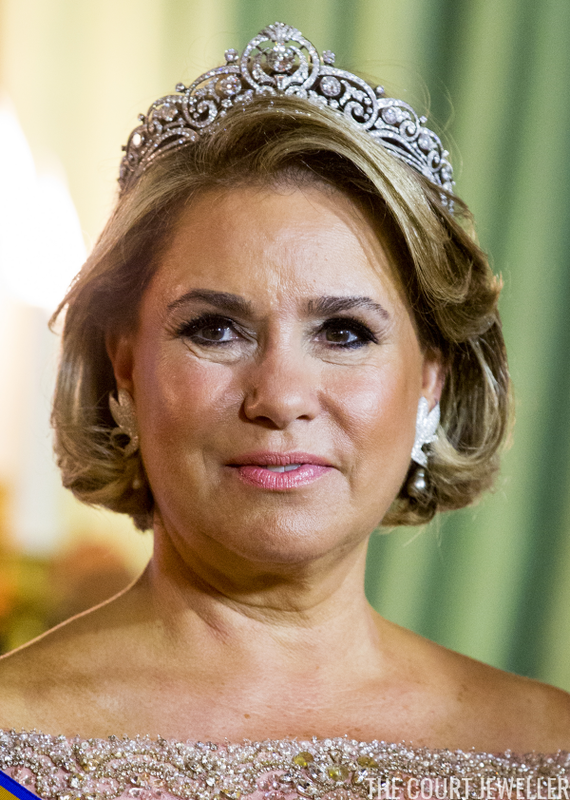 The grand ducal family were the hosts of the evening, and Grand Duchess Maria Teresa sparkled in the classic Belgian Scroll Tiara, pairing it with her modern pair of diamond earrings with gray pearl drops. 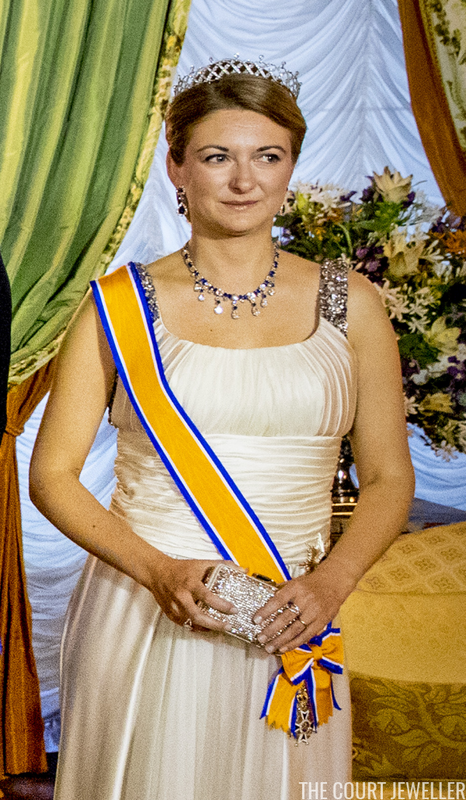 Hereditary Grand Duchess Stephanie was also in attendance, wearing the family's Chaumet Choker Tiara without its pearl toppers, plus one of the family's diamond and sapphire necklaces and diamond and sapphire earrings.